Fairly common in Kitsap and Island Counties. In King County, common at low elevation, becoming much less common at moderate elevation and uncommon and local at high elevation. 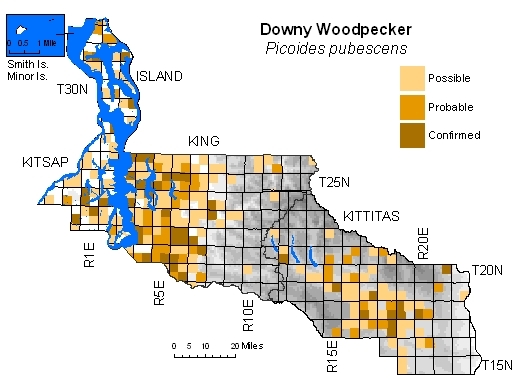 In Kittitas County, common primarily at moderate elevation, becoming uncommon closer to Cascade crest. Only one record along Columbia River, contra Washington Gap report's predicted distribution along entire Kittitas County shore (Smith et al. 1997). 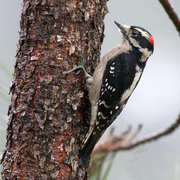 This small woodpecker prefers hardwood and mixed forests, residential areas with hardwood trees, and hardwood-dominated riparian areas.